Very cool rides for both of you! Thanks for sharing! This is my newest. Few things on the way still. 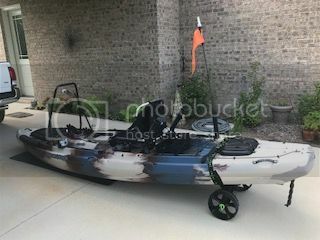 Marine mat, yakattack paddle roller holders another fly rod holder, tail drag skid, maybe an anchor system down the road but not sure on that yet. This thing is crazy stable and runs super skinny water even with my 250 and a full yeti 20.
super quiet, light weight, and will dunk you if your not paying attention. Thought I would post a link how you can have your cake and eat it too when it comes to pimping out a Cobra Fish n Dive. Please note I dont use all that gear at once as seen in the first picture. 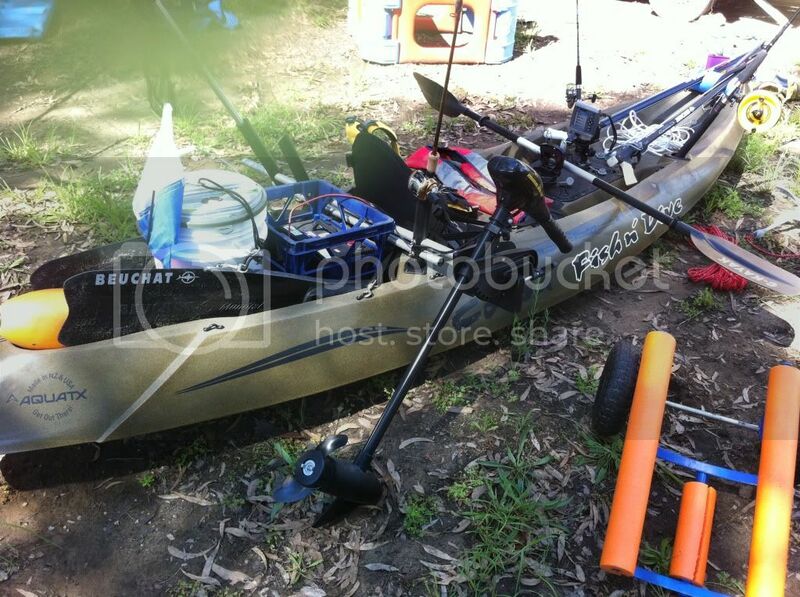 Also note in first photo is twin speargun mounts like a gun rack on a quad bike for spear fishing. 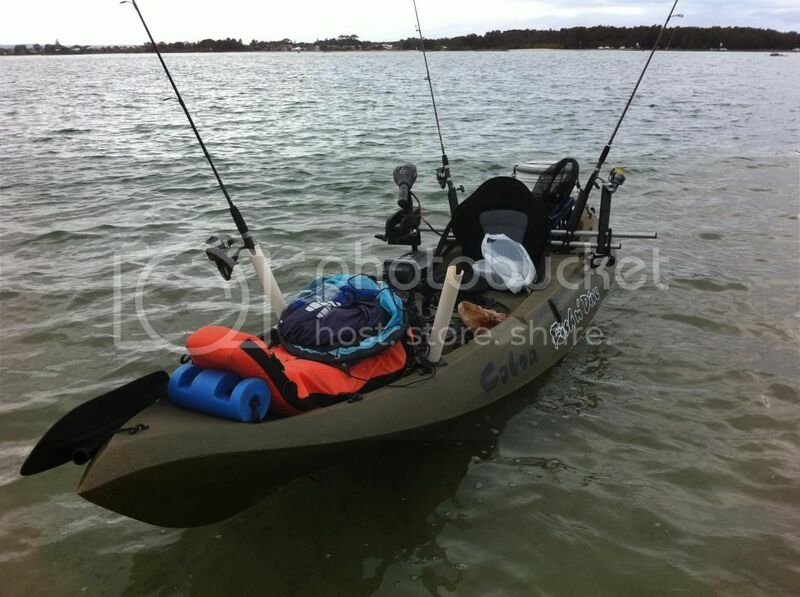 When I am BTB fishing, I keep my yak pretty bare and simple plus have everything secured and on leashes. I am in the process of fitting an anchor trolley, I bought the hobbie kit version. I was kind of torn between this and the Jackson Coosa , ended up going with the Kilroy and haven't been regretful yet. Eventually I would like to get a pedal drive to cover more ground faster, but for the type of trips i do this works perfect for me. 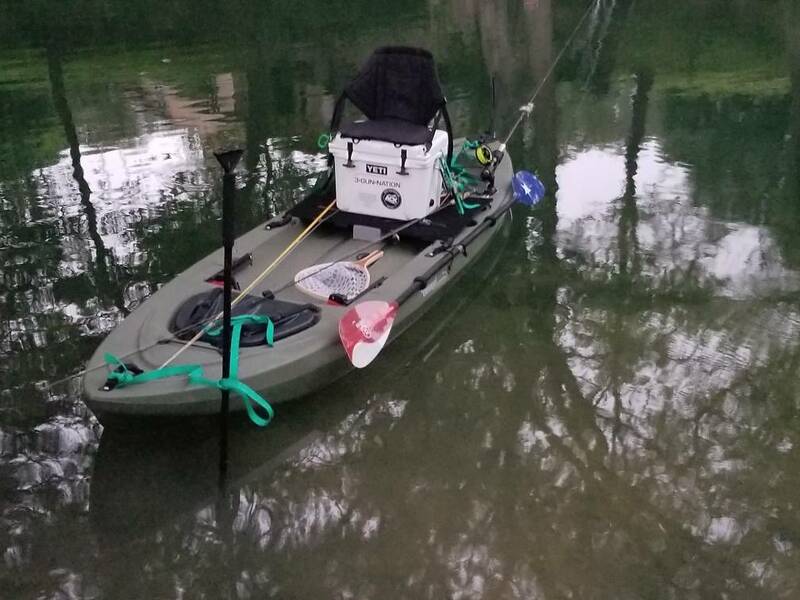 Very stable, stand up and sit down easily, very comfortable standing ad fishing, has a stand assist strap that works well, most comfortable seat out there, came with a Thermarest lumber support for the long days on the water. Very strong, well designed, fast, turns on a dime, tracks awesome, and you stay dry out there. Lots of storage space and mounting tracks for all my gear. I just picked this up last Sunday and have only had it on the water once. I'll have to do some real fishing before thinking about rigging. First, let me mention that I bought one of these through a program where early subscribers could purchase one ahead of the release at a substantial discount. They retail for $3499 and I think I paid $2399 for mine. Cost wise, the current retail price is, more or less, consistent with other big kayaks, say Hobie PA 12s and PA14s, the Natives and several others. Is it a kayak? Well, hmm??? It is 13'4" in length, so not any longer than many fishing kayaks, actually sort of average; and, it is 48" wide, so about 6" or so wider than a Native Titan Propel. 3) It isn't very fast, I'd say 3.5 MPH might be maximum speed. So, more pros than cons. Finally, gosh, it comes with a seat bag, 2 rod holders, a "thingy" to hold your water bottle, tools to work in the "boat," and more. I'd give it a solid "A" for anything from small pond fishing to large lakes. I'd be hesitant to shoot down a river where you might run into something between the two hulls and get spun around, or worse. Too, it'd be super fishing flats, not so much I suspect offshore. It won "Best in Show" at the ICAST this past summer, so others like it, too. Hope this helps!!! No, just a retail buyer, no business or financial links to BSB. I saw this at Fishing Tackle Unlimited (on I-10) for the first time last week. Super nice ride! Where do you fish? Have a couple Hobies, a PA14 and a 17t. This is my big ride, which was rigged solo. Here’s my new Old Town Topwater 120, I’m still in the rigging process. I’m trying figure out if I’m using the transducer area on the bottom of the kayak or get a portable rig. I have a Garmin to mount. Nice looking yak. I really like the colors. That bungee color really pops against that turquoise. Nice to have a blank slate to work with and rig the way you want it too. Many good adventures lie ahead!